A fun sci fi written in 1980, about a very small neutron star that has …. gasp! …… a sentient, intelligent species on it. Because the star had such strong magnetic lines, and extreme gravity, the creatures were flat. I continued to picture them as snails without shells. Dragon’s Egg was a neutron star, an incredibly dense sphere only twenty kilometers in diameter, with a surface fravity sixty-seven billion times that of earth. No human could ever land on such a star. Only by the most advanced technology could science even study it. Researchers detect intelligent life: the cheela, aliens who live so fast that one of our hours is the equivalent of more than a hundred yhears to them. The cheela struggle from savagery to science in a span of days (human days). The cheela are flat, amoeba-type creatures about 2.5 mm in radius, and 0.5 mm high, with a density of 7 million g/cc. After making contact through light pulses signals, the scientists begin to send down data about technology. Since it takes weeks for even a human sentence to be completed according to the cheela’s speeded-up time perception, they have plenty of time to study the information, gradually evolving over generations to develop a technology even greater than the humans. All this takes only about 4 human days. It was a truly intriguing concept for me, the vast disparity between the time lived and how the two species managed to communicate and develop relationships. It was a wonderful break from the typical space opera battles and betrayals and ill-will between species and planets. But. 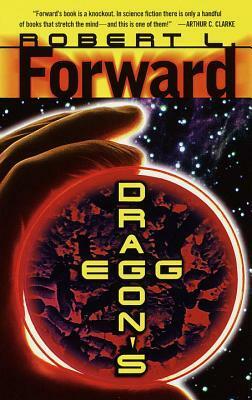 In the sequel, a starquake rocks Dragon’s Egg, decimating the cheela. On the surface, the few survivors fight to stay alive. Meanwhile, in orbit above the star, their human friends face a dreadful choice: return to earth and let this alien race risk extinction, or remain to help and possibly, maybe certainly, die in the attempt. Glad you enjoyed this. Do you think you’ll search out any more by this author? Maybe. I am down to my last 8,000 titles on my TBR list, so possibly I will see what else Forward has written.